Counterterrorism. Direct action warfare. Special reconnaissance. Foreign internal defense. Taking out the world's most hunted terrorist, Osama bin Laden, deep in a foreign land and in less than 40 minutes! All in a day's work for the U.S. Navy SEALs. They are the U.S. military's super soldiers, trained to the highest standards to conduct clandestine missions behind enemy lines. Achieving the impossible by way of conditioned response, sheer willpower, and absolute commitment, our U.S. Navy SEALs are the ultimate warriors and unsung defenders of our great nation. 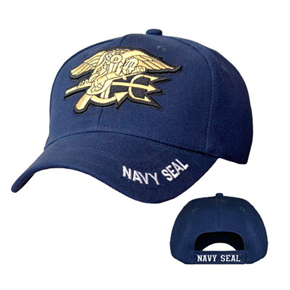 They are the best of the best, and now you can stand tall and support their incredible efforts, dedication, and sacrifice with your own Navy SEALs Cap. Wear it with pride and send a message to terrorists everywhere that we are the United States of America. We don't tolerate or negotiate — we retaliate.